The Bay Area real estate market and especially homes for sale in Oakland, Piedmont and Berkeley. They are HOT, HOT, HOT! And it’s heating up even more as we enter the spring market. SF Gate just did a story on this exact topic. Low rates and low inventory are combining for one competitive market. Multiple offers are once again the norm. I have 3 homes coming on the market and while prices are not where they were in 2007, the temperature of the market sure is. As a listing agent I position my listings for multiple offers. Pre-inspections are the norm. Getting bids for every property deficiency is the norm. I advise my home sellers to remove as many “unknowns” from a property as possible. Buyers are willing to buy homes in need of work, they are not willing to buy into unknowns. If you’re a Buyer entering this market, you best come prepared. Consider doing your own pre-inspections. Keep your expectations realistic. And if you’re not 100% pre-approved… Forget about it. You’re going to get beat in competition. I’m happy to help you find success, even in the nuttiest of markets. Brian Santilena is a Senior Sales Associate, Realtor and CRS with Pacific Union International Real Estate. 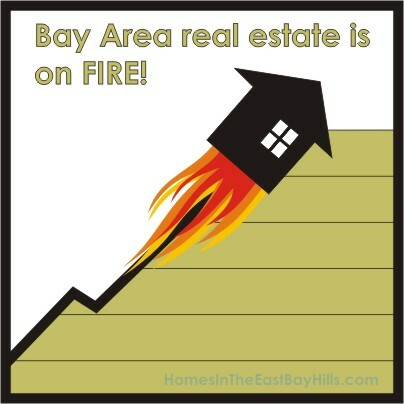 He’s sold over 300 homes in the Oakland, Piedmont and Berkeley CA market places and continues keep the market updated here and on his HomesInTheEastBayHills Facebook page.